The sun is shining and the Pink Pony is ready for the Memorial Day Weekend. We would like to wish you a happy Memorial Day weekend. Lots of sunshine in the forecast…. We’re getting the beach ready for another great season!. The Mission Point hill daffodils are in full flower! So beautiful. Happy Mothers Day!!!!! It is GORGEOUS out this morning! 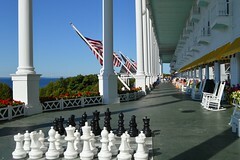 A Horse Drown Carriage passes Grand Hotel on it’s tour of Mackinac Island. PINK PONY OPENS FOR THE SEASON MAY 8: The crew at Pink Pony have been hard at work on some major renovations to the bar including a new Brazilian cherry hardwood floor. The season opening is TOMORROW, May 8. Free appetizers from 4pm – 6pm, complimentary samples of the new Pink Pony Ale from 4 – 8pm and Chimney Rock band hits the stage at 9:30pm. Good morning from a misty Mackinac Island. We hope you have a great week. 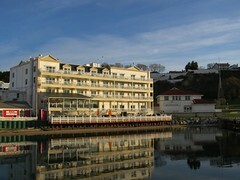 Sunshine and my first sighting of the Grand Hotel carriage. It’s a good start to the day. Yahoo! Our copper kettles are heating up again! 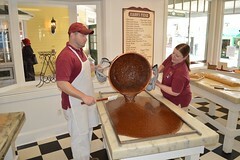 Love the aromas of chocolate fudge pouring onto our marble tables. — with Linda Gregorian and Yuri Vasilaki at Original Murdick’s Fudge. Great news!!! The Anna May has proven herself worthy today as she broke through the ice barricade which has been barring our way! She is now in open water with the mission of clearing out our other St. Ignace and Mackinac Island docks. This gets us one giant step closer to running passengers to Mackinac Island!. Please stay tuned for more information. Congratulations to our transportation partner Shepler’s Mackinac Island Ferry for being the 1st vessel to arrive to Mackinac Island this season. We look forward to a great season!